Many moons ago, Joe’s Dad (Big Joe Sr.) sold Hoover Vacuums door to door all the way from New Jersey to Maine. After becoming the top salesman on the northeast coast, he had a decision to make… to move forward with Hoover or go out on his own. Being the true entrepreneur that he was, Big Joe opted to open his first vacuum store in NJ in the early 1960's. Fast forward 10 years… Big Joe Sr. now had 8 locations in NJ and 3 in Florida. Fast forward 1991. After a stint in college, our Joe decided to marry his high school sweetheart, Joyce, and open his own Vacuum / Home care center in South Florida. He worked hard and built a great little business for him and his family of four. But, he wasn’t quite satisfied with many of the products that he was selling, so he began to develop his own! Creating some fantastic items like our Professional Formula Stain Remover and, the then popular Quick-Vac Cordless Vacuum. With his new stable of products, Joe started to attend the Vacuum Dealer Trade Association show where he would meet fellow retailers, who would go on to sell our products in their vacuum stores across America. One day Joe’s mother told him that she was going to The Home Shopping Network to model for a cosmetic company. He said "Mom, I have this great little cordless vacuum, get me the name of anybody I can show it to". And she did just that. 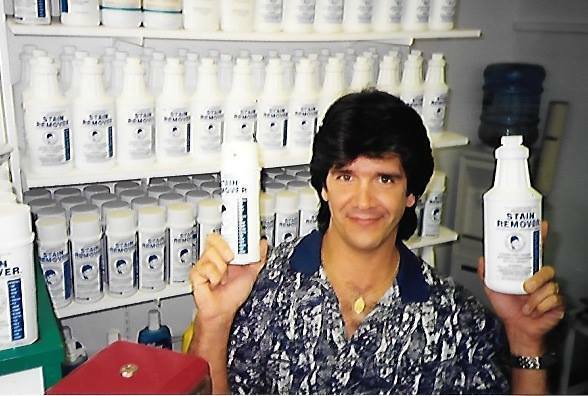 So Joe drove to Clear Water, FL, and pitched the Quick-Vac and the folks at the buyers at The Home Shopping Network who were willing to give Joe his first shot on national television. And during his very first airing, Joe sold out. That was when everything changed. By the early 2000’s Joe’s business was growing rapidly, so he made the move to QVC. But even with the growing work load, Joe was still a one man band. He needed someone smart and that he could trust to help him take things to the next level. As luck would have it, his brother Chris had just finished college at The University of Florida and so Joe made him an “offer he couldn't refuse”. Thus was the beginning of the "Brothers In Grime". At present, with more than 16 years on air with QVC and returning back to HSN as well, not to mention selling on Amazon, we are still small in employees but big in sales. The one man band is now a 6-piece consisting of Joe, Joyce (Joe’s wife) Chris, Stella (Chris' wife), Joe’s son Santino, and our overseas representative and honorary Campanelli, Linda Liu. How about this… we all work from home. No office. We communicate via email and phone from New Jersey, Florida, California, and China on a daily basis. All by design. Allowing us to keep our company at a size we are comfortable with. We are hard working, honest, and grateful for our customers and the many opportunities given to us by the platforms we sell on. This is our (Awesome) story.